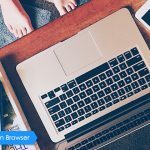 Maxthon Cloud Browser for Windows V4.4.4.1200 Beta is Released! Today, we have a beta version 4.4.4.1200Beta available for you to try out . This beta version mainly focused on some features optimizations and on fixes of quite many bugs as detailed in the changelog. Please try it out and any comments from you will be warmly welcome. “Subscription Rules Title” display issue. Maxthon Cloud Browser V4.4.4.2000 with AdBlock Plus is officially released! 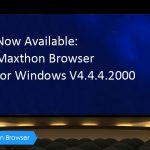 Maxthon Cloud Browser for Windows V4.4.5.1000 Officially Released! Maxthon Cloud Browser for Windows V4.9.2.1000 Officially Released! 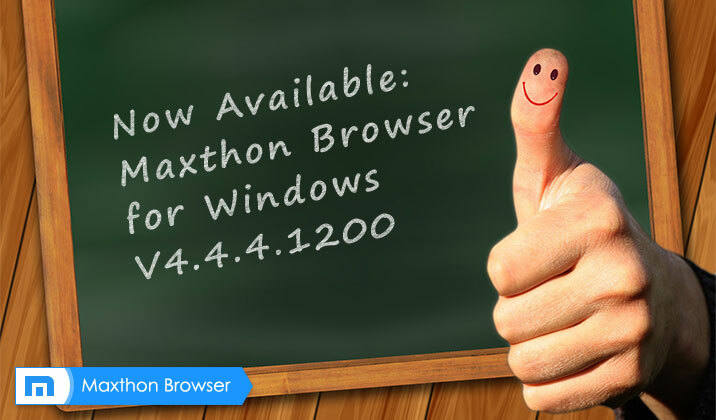 Maxthon Cloud Browser for Windows V4.4.0.4000 is Officially Released! O Maxthon Browser 茅 um Navegador completo. Com tudo que o usu谩rio precisa pr谩 navegar na Internet, seguran莽a e complementos variados. Sou usu谩rio satisfeito e recomendo. well, so far so good but, (there’s always a but) you still not have the “about:flags” and “about:plugins” however you have “about:gpu. I understand that those features aren’t for the average Joe but for power users they are, imho, essential. Oh, well, let’s wait for the next version and see but to me that it’s a big no no! thanks for adding adblock though. Your’s is a point of view where real iniceltgenle shines through. e bom mas de vez em quando o meu da crashed num sei pq sera que e pq eu tenho o google e o internet explorer bowser ? Voc锚 poderia por favor descrever em detalhes o problema que voc锚 veio atrav茅s de? Isso vai facilitar o nosso pr贸ximo teste, a fim de identificar a causa do seu problema. Olhando para a frente para ouvir de voc锚, e vamos respond锚-lo em breve. Would you please describe in details the problem you came across? That will facilitate our next testing in order to identify the cause of your problem. Looking forward to hearing from you, and we will reply you shortly. Why we called it Nitro Maxthon Cloud Browser V4.4.4.2000 with AdBlock Plus is officially released!